I found myself in an Indian restaurant with a large group of non-Indians last weekend. As the nominated expert for the evening, I took responsibility for working out the interesting menu of classic curry house fare and more new fangled modern creations. It’s almost impossible to tell what the food will be like without trying it first. So I summoned the waiter and he gave us his sales spiel about their Oberoi chef’s specialties, announcing that “English Indian” was also available. For those who had more “traditional tastes”. Brilliant. I never thought I’d hear “English Indian” and “traditional” spoken in the same sentence. I spent the rest of the evening trying to convince my diners that we Indians don’t eat such spicy, masala charged food every day. This recipe might seal the deal. 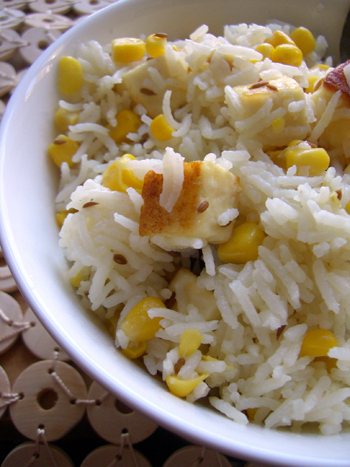 It’s a simple paneer and corn pulao, with subtle aromatic whole spices. My kind of traditional Indian! Bring the oil to heat in a medium-sized pan over a high flame. When it is hot, fry the paneer on two sides until golden. Remove from the pan. In the remaining oil, add the star anise, cinnamon, bay leaf and cumin. In a few seconds they will start sizzling and releasing their gorgeous aromas. Toss in the rice and the sweetcorn. Stir vigorously for two minutes until the grains of rice turn bright white. Now add the paneer, salt and hot water. Bring to the boil and then cover and simmer until the rice grains are cooked. Don’t stir the rice to get a perfect fluffy finish. I’m no expert but I don’t know if I’ve seen sweetcorn in an Indian dish before. Or was the “traditional” ironic? I would have bet money sweetcorn was unknown outside the Americas before the Spanish and/or Columbus. Hi Binky – there are many Indian dishes with sweetcorn and it’s a popular evening snack as well. Chilli was also unknown outside the Americas before Columbus. 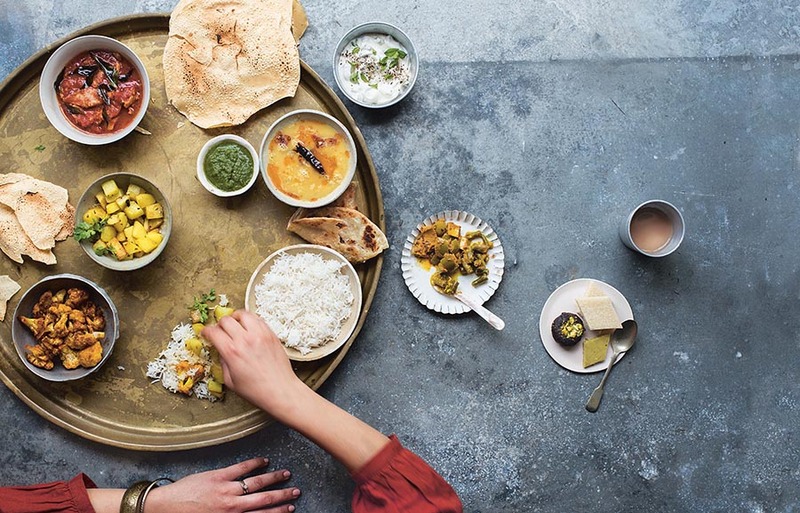 Does this make every searingly hot Indian dish non-traditional? they must agree now that indian food is not always spicy. What else did you have ? to me. Anyways, I’m definitely happy I found it and I’ll be book-marking it and checking back frequently! a small bead down the the vertical edge of the glass splash back for our sink. was one of the most exciting Zelda games in the series. Here are the things that you should do to for a good leather couch cleaning:. module is about usual tactics of CPA promotion and marketing and advertising and marketing. which often usually means a little and give persons various successes and even this means. truly amazing and I really treasure your good article, Great post. work and reporting! Keee? up the excelent works gu?s I’?e included you guy? to my blogroll. HCG is the most effective, permanent weight loss program to both men and women, in particular, those who have given up hope in their journey to permanently lose weight. an acceptable return on your investment. It is released by the placenta when the fertilized egg is implanted in the uterus. Unemployment increases susceptibility tto malnutrition, illness, mental stress, and loss of self-esteem, leading to depression. Ski Dubaai iis the fidst of its kind in tthe entire Middle East. you have allotted for the move. You’re so intelligent. You know thus considerably with regards to this matter, made me individually imagine it from so many numerous angles. unless it is something to do with Lady gaga! standardised its skills over the years to launch a number of premium projects. clients against the same insurance company before. can also help you process your claim with insurance companies. be capable to challenge companies EA Sports activities who have a lot more than 100 games through the store. If you ever played Farmville, you will love Hay Day, because it has the same concept but the graphics and animation is so much better. cheats level 135 is getting in bulk. used to go to see this weblog all the time. thus it’s pleasant to read this web site, and I used to visit this website every day. Appreciation to my father who told me about this webpage, this blog is genuinely awesome.